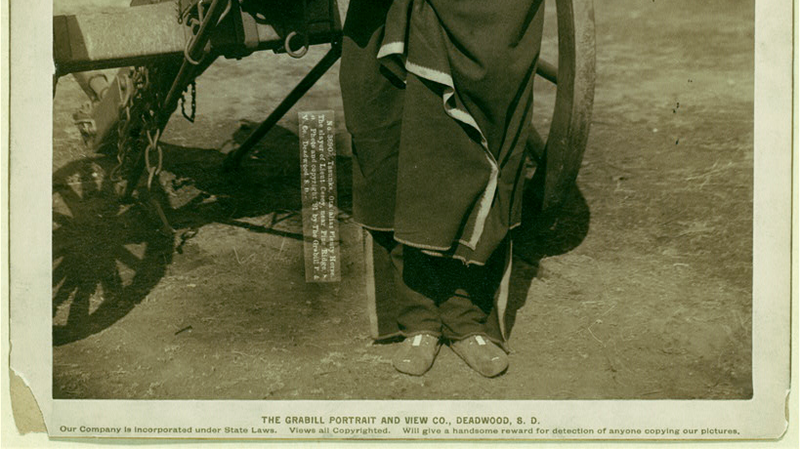 The Grabill Portrait and View Co., Deadwood, S.D. Our company is incorporated under State Laws. Views all copyrighted. Will give a handsome reward for detection of anyone copying our pictures. When talking about pionneering technologies, it is popular to use metaphors related to the 19th century American Old West. In this regard, Internet and its “Electronic Frontiers” is no exception and is still widely seen as an ex-wonderland of free spirits, that is now suffocating under corporations. After a few decades of educating savages with marketing best practices, apps and black boxes, the Net is perceived today as a bureaucratic conquest where the old world settlers are imposing their law in order to control the natives’ digitally born content. From the settlers’ perspective, it is a matter of utmost concern to deliver market freedom and open web evangelism so as to get rid of the axis of digital evil in the name of privacy, security and year-end bonuses. This set design is not so distant from the epic landscape depicted by Sergio Leone in ‘The Good, the Bad and the Ugly.’ As a matter of fact, by superimposing the film’s archetypes on top of the main Net culture content creation mechanisms we may well obtain a prophetic narrative for present and future creators. More precisely, as of today, the Good creator is the one that is respectful of the code and law and contributes to its ongoing evolution and interpretation. Depending on how she envisions the question of access, publishing and sharing of information, she can either adopt a copyright or copyleft practice, that, which in both cases aims at making legitimate a conditional access to culture. At the opposite, the Bad creator is the outlaw. She is frequently mashing up material from peers or the Good, following unspoken, illegal, poetic or politically charged rules of attribution, if any at all. Just like the symbiosis between the media industry and piracy, the Bad is in fact manipulated for the sole profit of the Good who will not hesitate to get rid of the former, once her part has been played. Resistance is futile. Avoiding this lethal relationship is impossible because anything that is not explicitly developed within an appropriate legal framework is constantly threatened to fall back into law and order. The artistic software PiDiP, released with a copyleft license, has been outcast from the Pure Data community, because the author refused to remove a personal statement that conflicted with the GPL. With such a dichotomy, the practice and intention that led to the creation of PiDiP becomes incompatible with its technical and legal framework; it contradicts the system it is born within. Yet, the systems survives the paradox, becomes stronger, and bans the mutant software; enjoy tarring, feathering and the recovering of peace in the Pd community. This is a Baudrillard ‘prise d’otage’ that is turning ugly, but one that sets the conditions from which the third archetype of our tale will eventually rise. Even though the Bad has been killed, the Ugly, who somehow managed to survive during the whole tale, sees his life spared by the Good and is abandonned in a cemetery in the middle of nowhere. That he survives, or not, does not matter. As a lonely freak of nature, he can do no harm. Presented as the weakest role, the Ugly is in fact the most interesting character. He is everything that cannot be expressed by a content creator stuck in the binary morale. He is the grey zone that makes the social context of authorship and production tangible, yet compatible with the system. The Ugly is the Petri dish for new adaptations: the GPL is mutating into the e-GPL, the PPL rises from the CC-BY-SA, and the FAL turns copyleft software into system art. As we are getting closer to the end of the pioneering era of networked media,content creators are increasingly forced to be Good and make legitimate a specific definition of artistic freedom that goes hand in hand with capitalist and liberal agendas. Therefore, Ugly content and Ugly licenses must multiply and be encouraged. Together they form a novel form of legal avant-garde that is operating on the imaginary of production. By being able to interface their incompatibility with a system they challenge, they will avoid the fate of the Bad and like a mutating opportunistic bacteria, they might well rise from the cemetery and bring to its knees the sterile goodness of a world that forgot how bad it actually was: enter the dawn of the Ugly.